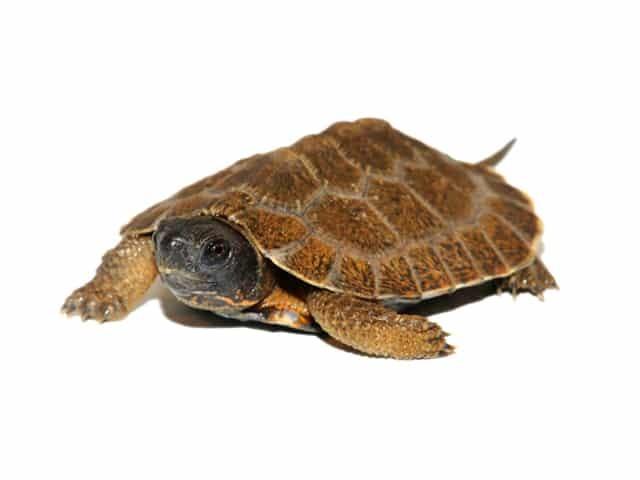 Also referred to as “old red legs”, the North American wood turtle has a very unique appearance. The carapace is broad and flat with prominent, rigid growth rings designed to look “sculpted” or like it’s made out of wood. Many wood turtles are usually stained from the rivers and streams they live in so when they are dry, the take on a uniform brown or slate grey coloration. The marginal scutes at the back of the carapace exhibit varying degrees of flaring and are serrated except in very old specimens. The ground color of the carapace is brown, black or yellow-ish and is covered in yellow to orange rays, flecks, radiations and spotting. Except for when very young and vulnerable, wood turtles should not be kept indoors. They are extremely active turtles that need to move about a large area. Summer sunlight and cold winters are necessary for this species to live long and reproduce. Babies can be housed in Rubbermaid totes on moistened peat moss with top soil. Several half logs or driftwood should be added for security. They may be more aquatic than their parents and so at least half the unit should be fitted with a large, shallow water tray/dish for swimming, drinking and soaking. They can and do drown, so be sure to keep the water area shallow (between 0.05-0.07 meters (0.16-0.23 feet)) and add plenty of objects to the water for them to grasp onto (fake/live plants, wood pieces, cork bark, river stones). One large Rubbermaid tote can house a dozen hatchlings for up to their first year. They grow quickly and once they are of at least 0.1 meters (0.3 feet), they can be moved outside. Wood turtles are aggressive by nature with cannibalistic tendencies. They will certainly eat their own newborns. Severe tail nipping is a common practice which is why most adults are missing at least part of the end of the tail. Watch closely for overly aggressive turtles, particularly males. Outdoors, Glyptemys insculpta will thrive in spacious, naturalistic enclosures. For a group of 2 males and 4 females, we recommend constructing a 9 x 6 meters (30 x 20 feet) pen made out of strong walls. Pressure treated wood, landscaping timbers, picket fencing and concrete blocks work well. Always be sure to completely secure the walls of the pen. Wood turtles are quite possibly the best climbers of the turtle world and have been known to scale 1.8 meters (6 feet) chain link fences with ease. It may be necessary to create an over-hang along the entire top of the walls to prevent escapes. While they may not be big diggers, they will absolutely pace along the walls looking for a weakness in the fencing or a spot to climb out. Inside the enclosure, a good sized water area should be provided. The land area is just as important and needs to be well planted and landscaped. Rotting logs, driftwood, boulders, slates and other rocks should be added as well. Wood turtles will appreciate these items by climbing over them, basking on them and wedging under them. Low lying shrubs, bushes, grasses, flowers and other plants should be randomly placed all over the pen. These create a natural setting and offer an abundance of hiding areas. A few pond plants like lotus, hyacinth, grasses, tussocks, sedges or iris adds a nice splash of color to the water area. It also provides the turtles with places to hide. Indoors, neonates should be kept on a peat/top soil mix. They must not dry out, or they will perish. Outdoors, the pen should feature sandy areas, along with leaf litter and rich soil. In nature, they occur in rocky areas so adding various stones, boulders or rocks to both the water and land areas are recommended. While indoors for the first year or so of life, Glyptemys insculpta should be provided with an ambient room temperature of between 24-27 ºC (75-80 ºF). This can be allowed to drop into 16-18 ºC (61-64 ºF) and even 14-15 ºC (57-59 ºF) at night. They do not like it hot; therefore, a spot light or heat emitter is not necessary inside the enclosure. Fluorescent UVB lighting should be provided instead which will benefit the health of the young turtles greatly. Outdoors, wood turtles should be subjected to all natural elements. This means, spring, summer, fall and winter temperatures along with weather conditions are beneficial to them. They do not fare well in very hot climates and should be offered an artificial cooling period no matter what, should the keeper want to breed this species long term. When situating the new outdoor pen, pick a spot that receives both full sun and plenty of shade. They need to be able to escape the heat by retreating to a shady area quickly. In the peak of summer when temperatures are high enough to warm up even the water area, wood turtles will need to find refuge in a cooler part of the unit. This species favors rain showers and thunder storms. They become active during them and just after them, especially in the morning. A 10×10 “pond type basin” can be created or you can even design a stream like we did. By digging an 18-24” deep trench about 15 feet long, you can make the width vary as you move down it. This makes for a naturalistic looking stream or creek for the turtles, much like what they would inhabit in the wild. Fish friendly pond liner found at all pond stores, Lowes and Home Depot is best to use. You can add peat and mud to the bottom and plenty of river stone, pea gravel or sand in it. In addition, the plants help to keep the water clean. We install a powerful pond pump at one end of the stream to keep the water constantly flowing slowly like a real wood turtle habitat. This in combination with the plants and rocky/peat substrate, keep the water nice and clean. Never let neonates dry out and always make sure they stay at a relative humidity level of between 80 and 90%. North American wood turtles accept a wide variety of food items. Like box turtles, they take both plant and animal matter. Live foods are relished such as mice, earthworms, super worms, grubs, slugs, snails, tadpoles and frog/toad eggs. Our adults have even managed to eat wild birds they find in their enclosure! They will also eat their young if given the chance. Strawberries, mulberries, raspberries, blueberries, bananas, peaches, melons, yams, sweet potatoes, grapes and tomatoes are also voraciously consumed. Glyptemys also learn to accept wet dog/cat foods. Only use brands with organic, natural or whole ingredients and do not offer constantly. Babies will take commercial pellets when being raised indoors but be sure to offer plenty of the above listed items as well. We clean the indoor Rubbermaid enclosures whenever the water gets dirty and we replace the water since we don’t use filtration. For outdoors we prefer to create a natural pond as mentioned above where the plants keep the water clean along with the pond pump. Frequently males are drowning females during mating under water which is why it is so imperative to make sure they can get out of the water easily. Respiratory infections immediately following spring emergence can occur as well. It’s important for G. insculpta to experience a long, somewhat consistent winter so as to prevent them from waking up prematurely which will lead to infection.